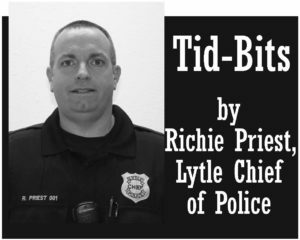 Just another week at the office for us here at Lytle PD, we made it through Thanksgiving and Black Friday without any major issues. We had a total of 50 calls for service (a nifty fifty) and conducted 19 traffic stops (8 citations & 11 warnings). A snapshot of calls includes 7 vehicle lockouts, 4 alarms, 5 suspicious activity or vehicle and 6 traffic accidents. We arrested a 27 year old male for a simple assault (enhanced to a Class A Misd.) and transported him to the Atascosa Co. Jail. He assaulted his 82 year old female landlord. But that’s not all, when Sgt. Hanson got him to the jail they found a baggie of heroin in his sock. He said he forgot about it being there, oh well who hasn’t forgotten about having heroin in their sock? My dad always told me to never hit a female; I guess he assumed the elderly part was a given. My dad also believed in working your kids so hard that they don’t have time to get into trouble and if they did get any free time, they would be too tired to get into trouble. I guess it worked in the long run but it didn’t seem so great at the time. Capt. Reyes arrested a male for public intoxication in the Bill Millers parking lot, initially he was treated by EMS but become combative. He was later transported by Ofc. Lopez to STR Hospital in Jourdanton. On Thanksgiving Eve, I was working patrol and was on my way to drop of a couple pork loins to Cpl. Robison when I was interrupted (he has a fancy pellet cooker and offered to help out with our Thanksgiving lunch plans). I was almost there when I saw some people surround a pickup in the parking lot of True Value. They saw me and started waving and the guy in the pickup took off quickly. I know a clue when I see one so I took off and stopped the guy on Main St. Yep, he tried to get out with a couple fancy flashlights and an earphone set. He dumped the stuff on the way out. After searching his car I cited him for theft. You know you’re a small town cop when the arrestee ends our encounter by saying “I’m glad you are still around, have a good Thanksgiving.” I’m happy to say that was our only theft reported last week and Cpl. Robison took delivery of my pork loins and they turned out great. Santa’s Hayride was a blast! I don’t have the final numbers but most likely somewhere around 1,500 people showed up. This event, along with the 4th of July fireworks show, are super popular city sponsored events. The weather was awesome and we didn’t have any problems. Nobody got hurt and everybody had a great time. The Lytle VFW provided a solid workforce to help load the trailers and the NHS from Lytle HS helped distribute refreshments. The event wouldn’t be possible without all the wonderful people who volunteer their time, truck, trailer and fuel to haul complete strangers around Lytle to look at Christmas lights. Of course the largest input came from all the people who showed up and stood in line so they could pile their family onto a flatbed trailer and let a stranger drive them around town. Our job is simple; we just block off intersections and try to protect the hayride. This year Atascosa Co. Pct. 3 Constable Ricky Luna and four of his deputies assisted with traffic control, it made our job a lot easier and it made for a safer event.